Twenty-five fatal mountain lion attacks are on record. Here's how each happened. Mountain lion, cougar, or puma: all these names describe the same animal, and it's one you certainly don't want to cross paths with in the wild. Although fatal mountain lion attacks are extremely rare, they do happen, and are often the result of cornering a cat, fleeing or playing dead. The following list showcases the twenty-five known fatal mountain lion attacks in North America, starting with the first in 1890. As you'll see, children are especially prone to being victims, with ten of the deaths attributed to those aged ten years or younger. Another interesting statistic is the rise in fatal attacks in the 1990's, with six occurring during that decade. Attacked by a cougar east of the Santa Caterina Landing. Attacked and killed by a mountain lion while in a tent. Killed by a mountain lion. 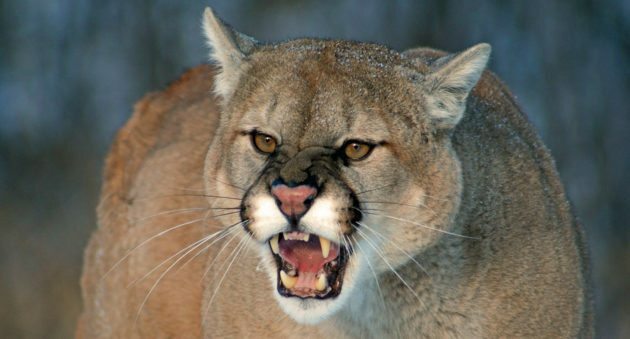 Rabid mountain lion attacked a woman and child in Santa Clara County. Both victims died from rabies, not from the physical injuries. This is the only instance of a double fatality and the only instance where the victims succumbed to disease rather than the injuries sustained in the attack. Killed by a mountain lion inside family home. Attacked and killed as he tried to outrun a cougar for about 300 feet. Attacked and killed while walking on a beach. Attacked, dragged off, and eaten. Attacked and killed by male mountain lion while playing with his sisters. Killed by a 3-year-old mountain lion. Killed by a mountain lion while walking on a road. Stalked and killed by a four-year-old male mountain lion at Catface Mountain. Attacked and killed by at least two, possibly three, cougars while riding a tricycle behind his home in Missoula County. Killed while jogging a familiar route on a hill above Clear Creek Highschool. Attacked and killed by a young female mountain lion while playing in the school yard. Long distance runner was attacked and killed while jogging on the American River Canyon Trail in California's Auburn State Recreation Area. Killed while hiking alone near Cuyamaca Peak in California's Cuyamaca Rancho State Park. Mother killed while defending her 6-year-old son on a horse back riding trip. Killed by an adult female mountain lion while hiking when he got ahead of his family. Killed by a mountain lion while skiing on Cascade Fire Road. Attacked and killed while mountain biking at Whiting Ranch Wilderness Park. It is believed his chain fell off and the mountain lion attacked when he bent down to repair his bicycle. Searchers found his body on this date near his mobile home. Investigators concluded that he had been attacked and killed by a cougar several days earlier. Eager to see first-hand what a close encounter with a mountain lion is like? Here's a video we recently published which may just make the hair on your neck stand up. Watch that incredible footage HERE. And here's a rundown on fatal black bear attacks over the last twenty years in North America. Read those stories HERE.